Concord Hospitality Enterprises Company and Kane Realty Corporation will build the new 135-room hotel, AC Hotel by Marriott Raleigh/North Hills, which is slated to open in first quarter of 2017. The hotel is among just 30 AC Hotels opening under the new flag in the next three years, representing Raleigh’s rise as a tourism destination. Marriott has approved longtime partner Concord Hospitality to open four additional AC Hotels in New York, NY; Pittsburgh, PA; Columbus, OH; and Orlando, FL. Concord Hospitality has partnered with Marriott International on the development of new hotel brands for the last two decades. That alignment for strategic growth and passion for delivering best in class service is represented in Concord’s achievement of winning the coveted Marriott Partnership Circle Award 10 times and this year, was inducted into Marriott’s Partnership Circle Hall of Fame for hospitality excellence. 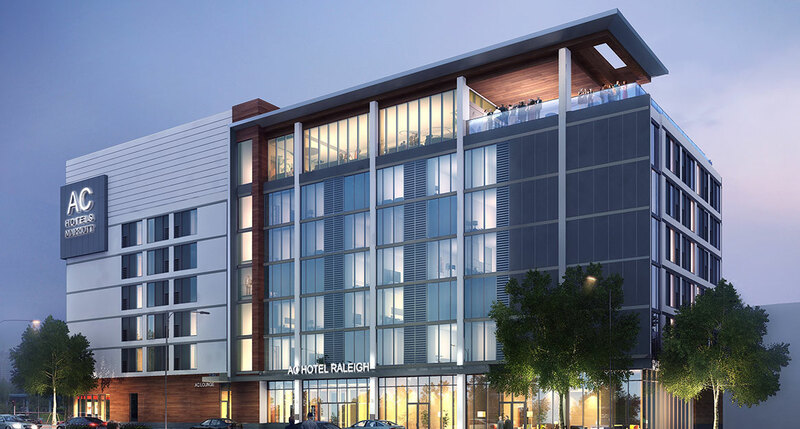 Concord Hospitality and Kane Realty have worked together on multiple projects since 2008, including the Renaissance Raleigh and Hyatt House hotels, both located in North Hills. North Hills, Kane Realty’s premier redevelopment, is Raleigh’s innovative mixed-use community, that includes high-end boutiques, well-known department stores, the Triangle’s best dining and a year-round calendar of entertainment. “While we have developed many hotels during the past 30 years, it is a special privilege to team with friends and respected colleagues from Marriott and Kane Realty to bring the AC Hotels vision to life in our own backyard,” said Mark Laport, co-founder, president and CEO of Concord Hospitality. décor in a neutral color palette with thoughtfully selected modern artifacts and decorative elements. The AC Hotel Raleigh/North Hills will include an energetic public space featuring a rooftop bar and terrace that will encourage an engaging atmosphere for guests to share and connect with signature cocktails, local craft beers, specialty wines and a curated selection of tapas-style small bites in the AC Lounge. The AC Kitchen offers a European-inspired Continental menu, with artisan sliced meats and cheeses, selection of pastries, sweet and savory egg tarts, and signature freshly baked all-butter croissants.